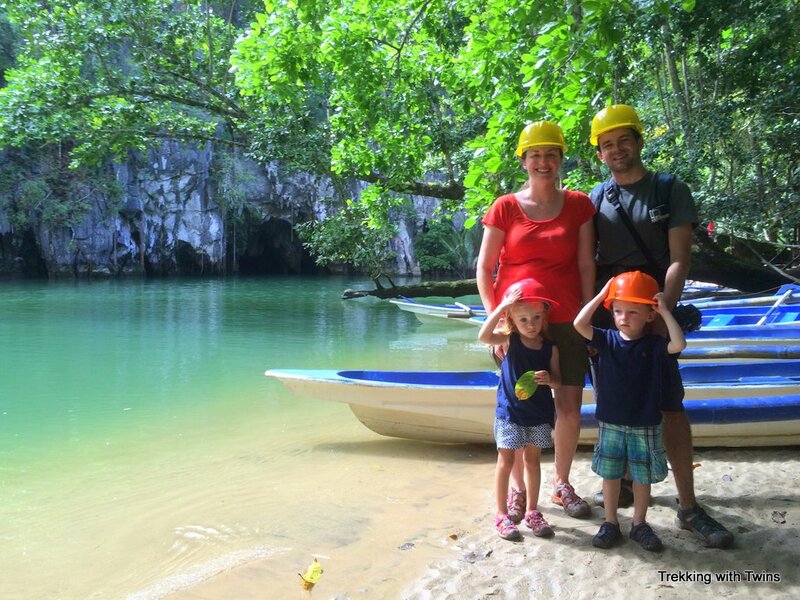 The Puerto Princesa Underground River, one of the New7Wonders of Nature and a UNESCO World Heritage Site, was a must-see attraction for us in Palawan. Even traveling with kids, it didn’t seem like it would be a particularly challenging sight to see as it’s typically accessed via a boat trip from Sabang. Sabang, in turn, is reached by van from Puerto Princesa. Easy enough. You need a permit to visit the Underground River as the number of daily visitors is restricted. 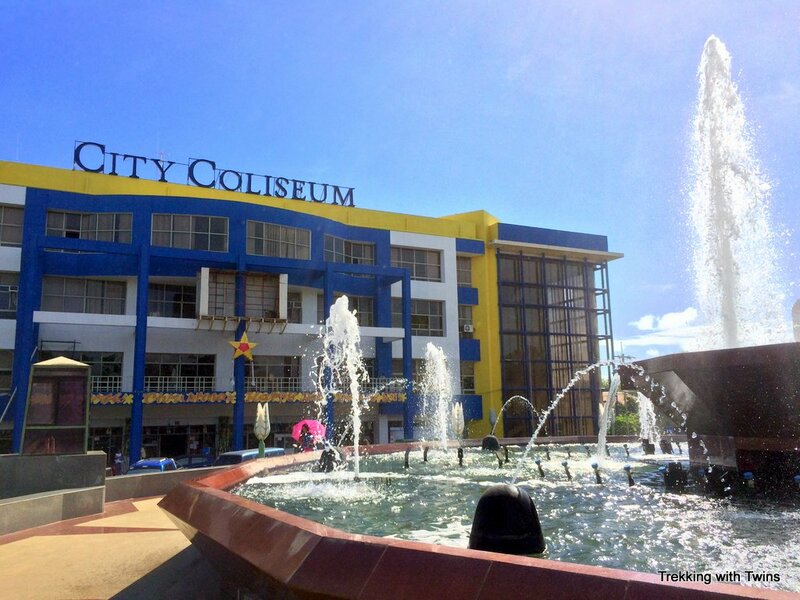 If you’re not going on a tour, you need to take care of this yourself ahead of time at the City Coliseum in Puerto Princesa. Like with Honda Bay island hopping, we wanted to do things independently (it’s cheaper this way, and we liked the flexibility) so during our stay in Puerto Princesa we stopped by the Coliseum to take care of that business. Tip: To get a permit to tour the Underground River independently you need to bring passports for everyone in your party to the Coliseum in Puerto Princesa. This is where you pick up permits for the Underground River in Puerto Princesa. When you arrive at the office there are several sign boards with instructions, but we found them more confusing than helpful. Basically you walk inside the office and when your turn comes up you tell the person behind the desk that you want to go to the Underground River, the day you want to go, and how many of you there are. They take your passports for a few minutes to make up the permits while you wait. When they’re done you get your passports back, pay the fee, and you’re all set. The permits cost 800 pesos ($18) for the four of us, and I think it was about 250 per adult and 150 per child. We planned to arrive in Sabang on a Saturday, and depart on a Tuesday. We didn’t think we’d arrive early enough Saturday to visit the Underground River that day, and we wanted to leave early on Tuesday. So that left Sunday or Monday to do the tour. We decided on Monday, thinking it might be less crowded than Sunday. We signed up for the earliest Monday tour available. It’s best to get on one of the first boats, before the crowds of day trippers start showing up. Saturday and Sunday we watched from the beach as boats motored back and forth from Sabang harbor to the Underground River. The seas were rough and we even commented on what a bumpy ride it would be for us on Monday. 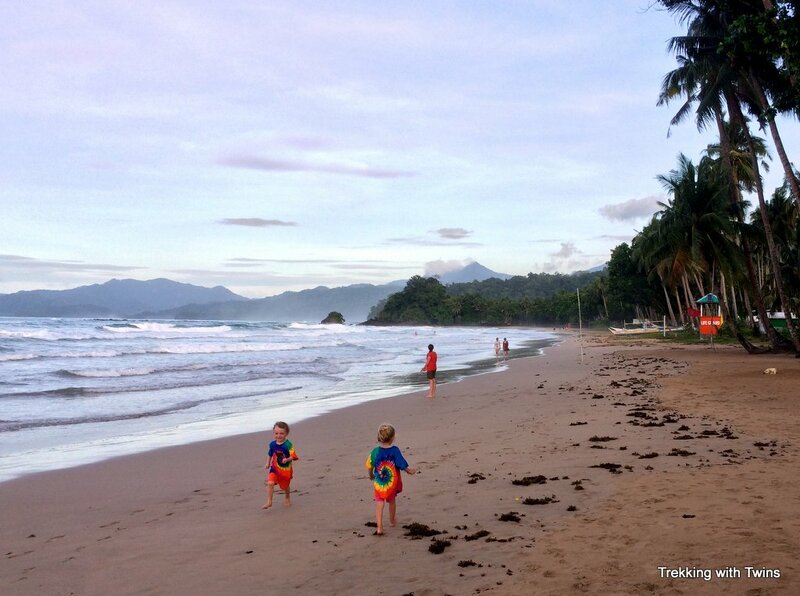 Watching the waves at sunset from Sabang Beach the day before we planned to visit the Underground River. Well, when Monday came we got up nice and early to head to the dock. What?! It was our last day in Sabang and we planned to leave at 7am the next morning. We had to see the Underground River that day. She went on to explain that apparently the seas were just a hair rougher than the previous days (they looked the same to us) and all the boats were prohibited from sailing. After a little more discussion we figured out that it wasn’t so much that the Underground River was closed (it was open), just that you couldn’t take a boat to get there. 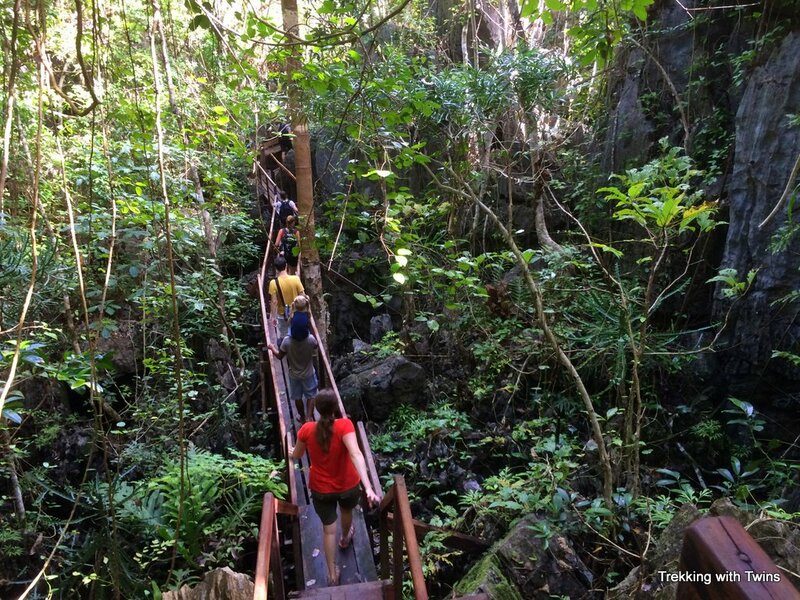 Lucky for us, there is also an option to hike to the Underground River from Sabang. To hike to the Underground River you need a guide. After paying our fees in the Sabang office, including a 500 peso ($11) Underground River entrance fee and 200 pesos ($4.50) environmental fee, we were led outside where the same tourist office woman approached a group of waiting guides to arrange for one of them to bring us. The guide fees are included in the entrance fee so we didn’t have to pay extra (except a tip at the end). These fees are in addition to the permit fees we previously paid in Puerto Princesa. The fee structure is different depending on if you hike or take a boat. This led to a very strange scene that we didn’t fully understand (they were all speaking Tagalog) but essentially looked like a bidding war among the guides to take us. One after the other kept leaping forward eagerly grabbing for the slip of paper indicating that we had paid our fees. Eventually she chose one and we set off. The trail to the Underground River starts in the mangrove forest at the far end of the beach, beyond Mary’s cottages, which is itself a relatively long walk from the harbor. After passing Mary’s you continue on to the mangrove forest boat tour office, where you board canoes to cross to the other side. The trail to the Underground River officially starts there. The official start of the trail… a long ways from the actual start back in Sabang. You hike along the edge of the water through the mangrove forest for a while, and this part is relatively flat. After a half kilometer or so, the trail turns left, uphill, into the jungle. It continues, mostly uphill, to a high point about a kilometer away from the Underground River complex. After reaching the peak it descends via a series of wooden ladders and platforms to a concrete walkway for the last stretch. All told the trail is about 6 km from Sabang to the Underground river. It was a lot steeper and muddier than we anticipated, and that 6 km felt endless at times. I carried Jasper on my shoulders the majority of the time and our spectacular guide, who was hiking in flip flops by the way, carried Aurora (wonder if he was still so glad to have us as clients). He set a brisk pace despite his footwear and passenger and we could barely keep up. We probably would have hauled hiking boots all the way around the world had we planned to do this trek, but I’m glad we didn’t because our Keen sandals actually performed really well through all the mud and rough terrain. 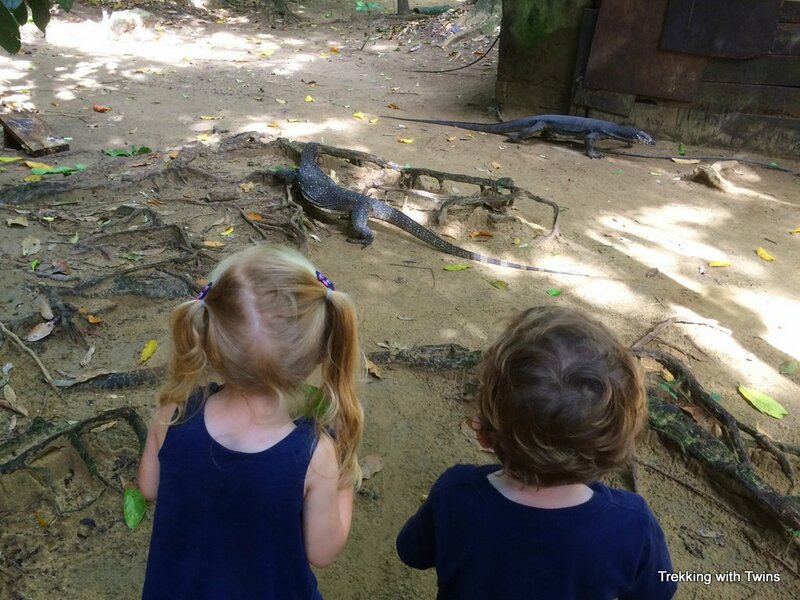 Finally reaching the Underground River complex we were greeted by a group of giant monitor lizards. These things were monsters, easily 3 to 4 feet long (bigger than the twins). The kids loved it and we had a hard time convincing them there was actually more to see (you know, like the whole New7Wonders/World Heritage Site thing). 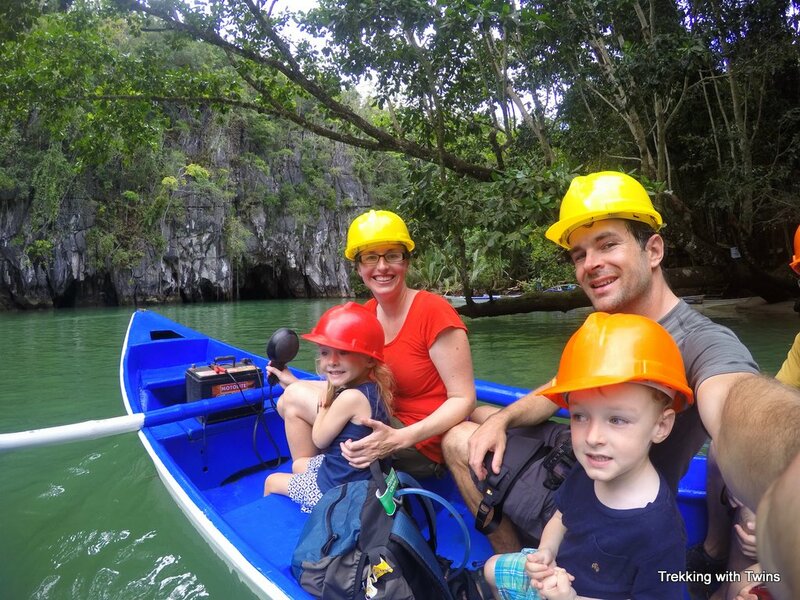 To tour the Underground River cave itself you board small row boats. The boats are paddled by a guide (different from the hiking guide) and they take off as they get filled up, with appropriate spacing so one tour doesn’t disturb the next too much. We sat in the front, and Kat even got the privilege of holding onto the big spotlight to illuminate our way once inside the pitch dark cave. This actually turned out to be not quite so great as the light attracted thousands of insects in the cave. Kat’s hand was covered with them the whole time! Approaching the opening of the Underground River cave. The tour of the cave itself was fun though relatively short. It’s about 45 minutes total and includes spotting a variety of rock formations that are supposed to look like everything from vegetables to Jesus. We’ve been to other places where they name the rock formations, like Sedona, Arizona, and understand there’s always a degree of imagination involved. But to my eye at least, these were pretty abstract. The guide also talked a bit about the formation of the cave, how far it extends, and some of the bats, birds and insects that live inside. The 45 minute tour explores just a fraction of the river system – there’s a longer tour for those interested that must be booked well ahead of time. We understand there is also a minimum number of passengers required to book the longer tour and it is more expensive. We really enjoyed the 45 minute tour of the cave. 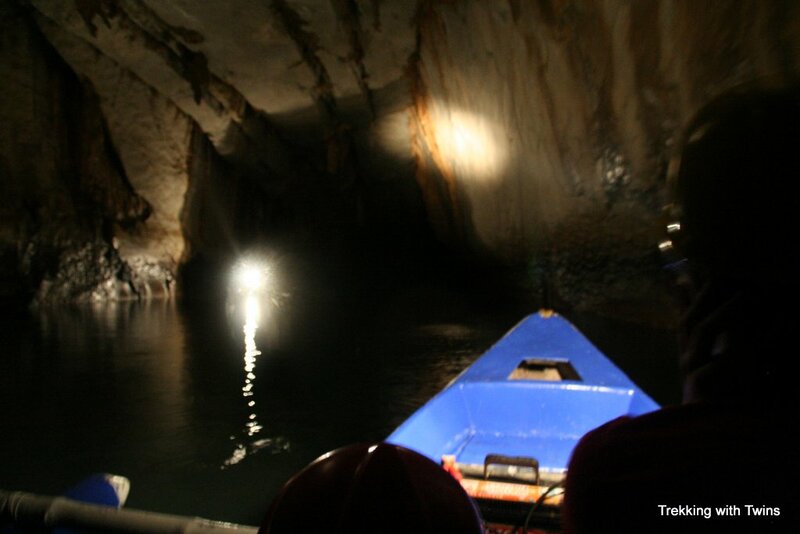 It’s a mix of tranquil river cruise and eerie cave exploring. 45 minutes was about as long as the kids could handle so we were glad we hadn’t tried to do the extended tour. Because the cave was so dark we got very few usable photos inside. Occasionally the light from another boat approaching was enough to make it come out. 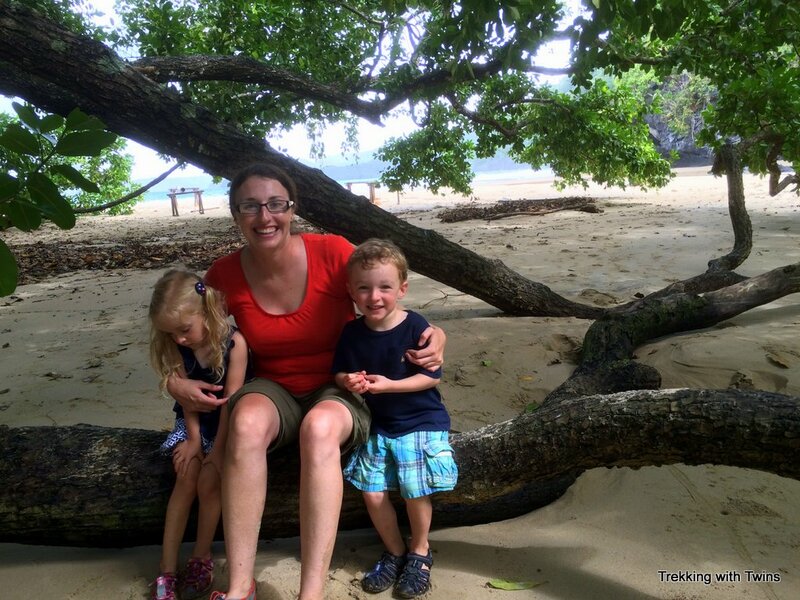 After our tour we spent a few minutes hanging out on the beach eating a snack and relaxing. We got some better pictures there. It was VERY dark inside the cave. Relaxing on the beach before our hike back. 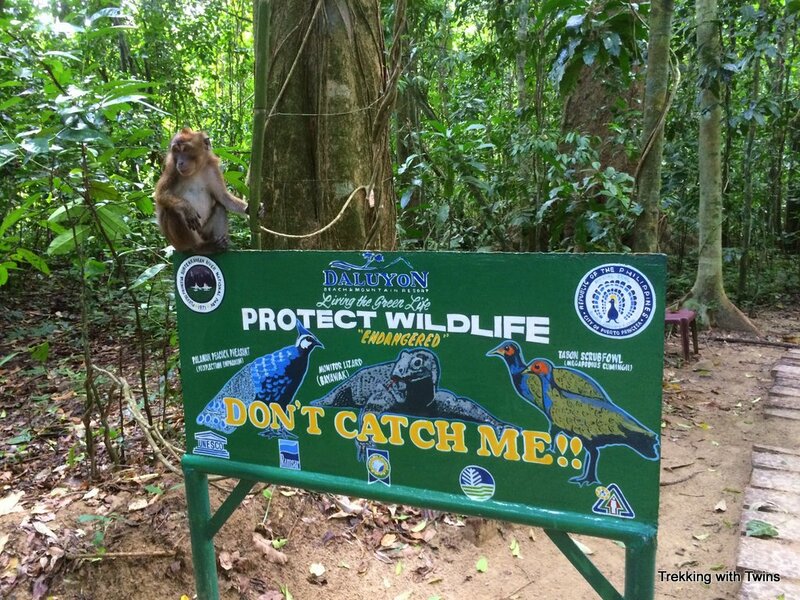 Before getting back on the trail we came upon a group of several big monkeys. We expected to see these guys from our reading, and had been slightly disappointed when we didn’t see them on the way in. The kids were bouncing up and down with excitement. Be careful though, when Aurora got a bit too close to one he hissed and bared his teeth. She calmly backed away and told us “he must be a little angry”. This monkey tried to eat my daughter. 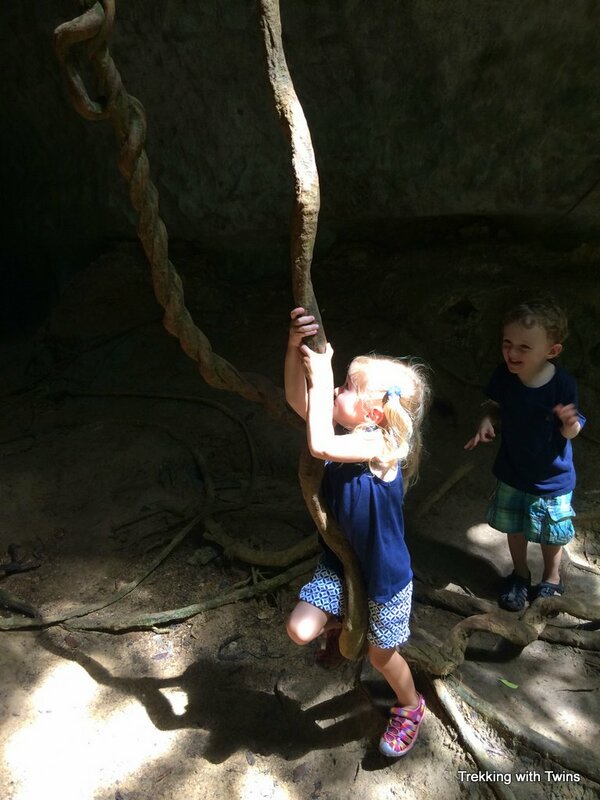 Swinging from vines along the trail. While the trek uphill was more physically demanding, the hike back to Sabang was incredibly difficult due to the bad footing along most of the trail. We were among the first hikers on the trail in the morning so despite rain the day before the trail wasn’t in terrible shape. But by the time we returned, several dozen other hikers had trampled the same mud and it was super slick. Remember, the boats weren’t running so anyone who wanted to see the Underground River that day was hiking. In addition to the footing issues it was pretty exhausting carrying a 35 lb kid on my shoulders plus a 20 lb backpack full of water, snacks, and camera gear. Our 3 liter water reservoir was full to start (good thing because we drank most of it) but at least the GoPro is light! As strange as it sounds though I actually really enjoyed it and I’m glad the boats were canceled. The jungle was full of primordial looking trees, plants, and vines. Giant limestone karst cliffs jutted towards the sky, and there was a chorus of insect and bird noises along with the occasional monkey call. Basically I thought I was in Indiana Jones (I’m not going to lie, I was humming the theme song to myself a good bit of the way). Dripping with sweat, covered in mud, and slightly bruised (I did take one spill on the way down) we emerged from the trail with tired smiles. We wouldn’t exactly recommend this hike for all families with young kids, but it was certainly an experience that holds a special place among the many “once in a lifetime” adventures we’re enjoying these days. Plus, we couldn’t very well call ourselves Trekking with Twins if we didn’t do some real trekking once in a while! If you’re feeling a little ambitious and want to see the jungle you might consider a hybrid tour: you could take a boat to the Underground River, and then hike back (downhill) if the weather has been dry for a few days to avoid the issues we had with the slippery trail. Ready to visit the Philippines? Start here and support our site by ordering our recommended guide book: The Rough Guide to the Philippines. So nice to hear from you Justine, thanks for writing! What a winter for us to leave New England! I didn’t know there’s another way to reach the Underground River! I actually think that’s heaps better than the boat. We went to visit a few years ago and the waiting time for the boat was really, really long because of the insane amount of tourists (first week of December). And before I forget, the twins look soooo cute! Thanks Tria! I agree, the hike was really fun and there was certainly no waiting 🙂 So glad you’re enjoying the posts. We loved the Philippines and hope more people have a chance to experience your beautiful country. 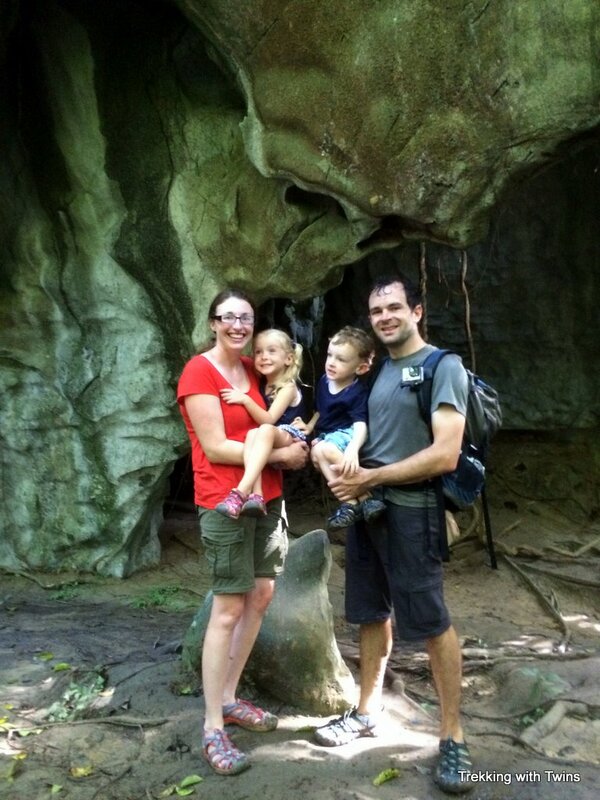 What an incredible family adventure! So enjoy following your travels. You are living the dream of many of us armchair travelers. Thank you for such great details about each location. It’s amazing how economical you can be as a family unit, very impressive! 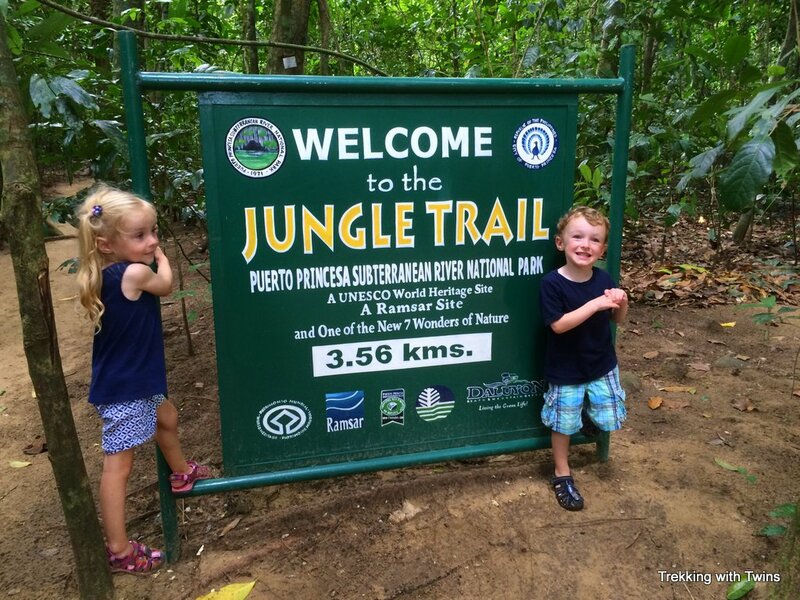 I can well imagine how beautiful the jungle trek was, love all the photography with Katie and the kids and you,occasionally. Especially loved the ‘learning to fly shot’ of you! Meanwhile, we are enjoying arctic temperatures and wind chill here in Rangeley, ME during school vacation. I believe it was -25 one stormy night this week with the windchill. However, it was a balmy 12 degrees when we went skiing today with bright blue sky, no wind and sun all day! Amazing how one acclimates to one’s environment. Looks like you guys are also acclimating well to the tropics! Looking forward to your next blog, love to you all. Thank you to Katie for her kind words about my mom. We miss you guys Alicia! Thanks for writing. Sounds like you’re having a fun trip up to Maine. We are definitely having skiing withdrawal this year, certainly none of that around here! We can probably do without the daily shoveling though 🙂 Glad Kate was able to get in touch with you – we’re thinking of you and your family. Take care, and stay warm! In getting the permit, is it true that they only allow 250 visitors per day in underground river? I understand that there is a limit, though I don’t know the exact number. I’m glad that you and your family have enjoyed the trip. I’ve been to the Puerto Princesa Underground River two years ago (we hired a travel agency then) and this October 2015, I’m tagging my boyfriend along…this time, DIY. How many days in advance do we need, in order to secure the PPUR permit? Do you think it’s possible that we fly in on October 3 and take the tour the next day? Or since there’s only the two of us, would it be better to just go through the travel agency again? Thanks much! Hi Gay! Sorry I didn’t respond sooner. I hope your trip was a success! How did you make out with the permits? Were you able to get them on short notice, or did you go with an agency?